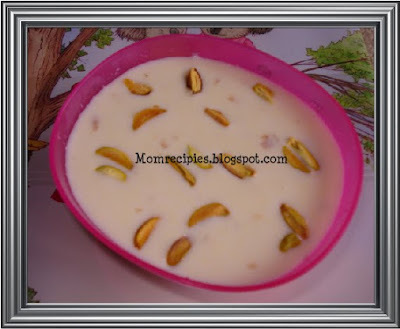 Paneer kheer / Payasam is an elegant and lip smacking dessert..It tastes same like Basundi ,but takes much lesser time than basundi to prepare.This kheer is winner in our family.Try it definitely I bet You will love this delicious dessert. Heat the milk in a broad non stick pan.Let it boil on medium flame stirring continuously till it thickens or reduced to half. Add 1 cup sugar and stir it gently. Cover and boil in low heat for about 5 mins. The mixture should not be too watery too thick .It should be like kheer texture. Now add the grated paneer, cardamom powder ,nutmeg powder and boil for 10-15 mins in low heat. Finally add Cashews after roasting in ghee. Remove from heat and let it rest for an hour in refrigerator. Serve chilled with garnished chopped Almonds and Pistachios. Truly delicious, I made it once, loved it. This is very yummy and lovely pudding, great presentation too.